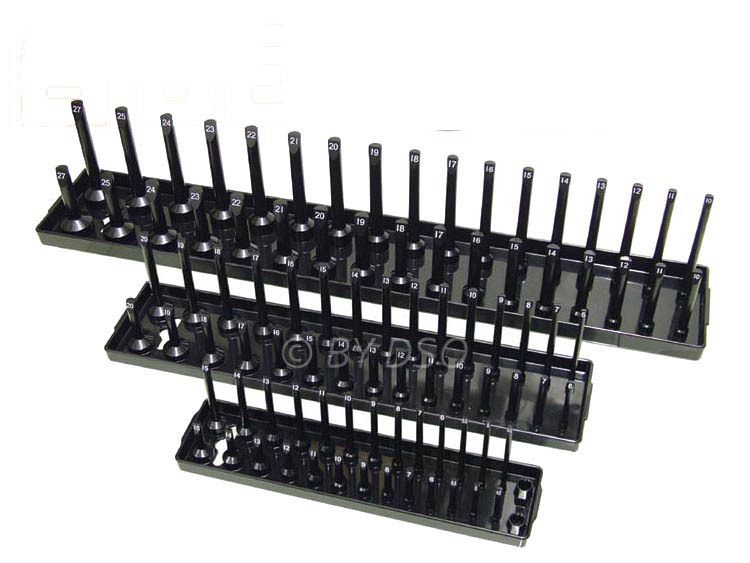 These racks display a set of shallow and deep sockets of the appropriate drive size. Three racks Made of high impact ABS plastic, posts are labelled with appropriate sizes for quick and easy identification. Resistant to oil and grease, perfect for the home garage or trade workshop. This item is brand new however the 27 mm 1/2" - 20 mm 3/8" Holder Broken Also Missing 1/4" Tray so it is a great deal, not to be repeated. There is no returns policy on this item. Whilst extra care is taken during the packaging process, we cannot accept liability for damage that may be caused during transit. All products carrying this disclaimer are pre-checked and where necessary, added protection is introduced prior to packing and despatch. There is no warranty offered in these items. Get it before it's gone!